I have an Electric Eraser I use on my artwork. They are a very nice addition to any artist's kit. 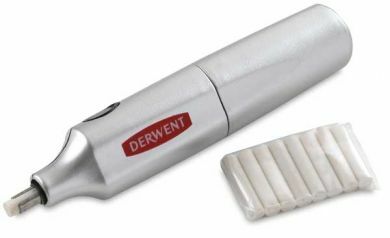 I have two of these electric erasers - a Helix and a Derwent and, whilst they both perform well, I've found the Derwent is the most reliable of the two. They usually come with spare tips - as shown - these tips are made of the same material as a standard plastic block eraser. If I am going to erase small areas or tiny details always "sharpen" them to a point before I use the eraser. 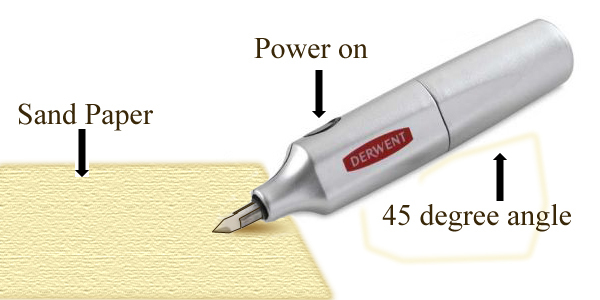 To do this, I fit a new tip and then hold the eraser at about 45 degrees to a piece of sandpaper, press the power button and gently shape the tip. After a bit of practice, you will be amazed at how good these units are for enhancing and cleaning up your artwork. I use these erasers primarily for my graphite and color pencil work, although I also use the them when I'm airbrushing. They will erase acrylics and watercolor as well. The only caution I would add here is: test the eraser on scrap first before you use it on your main artwork. These erasers are battery powered (2 AAA batteries). NB:They do flatten the batteries fairly quickly, so it's wise have a few spare ones in reserve. These erasers are readily available, just Google - dewent electric erasers - and you will quickly find a supplier. I bought mine on E Bay, it was around $15 or so. You usually get spare tips with the unit, but check to see if the supplier carries extra tips as well. While these erasers may not be the total deal for your erasing needs, I can't be without mine - I love 'em!